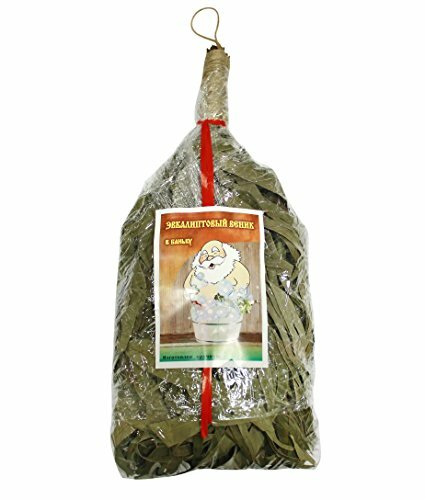 A besom made of eucalyptus is a real find for true experts of the Russian bath, sauna and healthy lifestyle. Due to the high content of essential oils and tannins in the leaves of eucalyptus, a besom made of this plant can be a very effective tool for recovery and infusion of vital energy. People also use it for relieving muscle pain, mental stimulation, memory improvement, keeping up their spirits, controlling drowsiness and fatigue caused by stress. It also should be mentioned that using eucalyptus bath besom a person can restore and greatly increase the tone of the whole body. Eucalyptus besoms very differ from other kinds of bath brooms. They are more convenient in use: because of soft branches during the process of steaming people can feel only gentle and pleasant touches. Comparing eucalyptus bath besom with other kinds of brooms, the first type has much better massage effect mainly because of the form and structure of eucalyptus leaf. What also important is that during the process of production all healing properties, appearance and durability of eucalyptus besom are surely saved. An eucalyptus besom can be used for several times, retaining its medical properties. During the first use, a besom should be put into the boiled water for about 10-15 minutes and for about 5-7 minutes when you use it for the second and further times. Eucalyptus besom massage increase blood circulation and therefore begins redistribution of blood, lymph and interstitial fluid throughout the whole body. Eucalyptus besom creates volatiles which kill bacteria. With the contact of skin, essential oils, which contain eucalyptus leaves and branches, can improve metabolism and prevent premature aging of skin. All eucalyptus besoms are made of the best eco-materials. If you have any questions about this product by RussianVenik, contact us by completing and submitting the form below. If you are looking for a specif part number, please include it with your message.